How would we expect global warming to affect the world’s amount of snow cover? The smart way is to recognize that higher temperature has two primary effects. First, whatever snow does fall will tend to melt sooner. 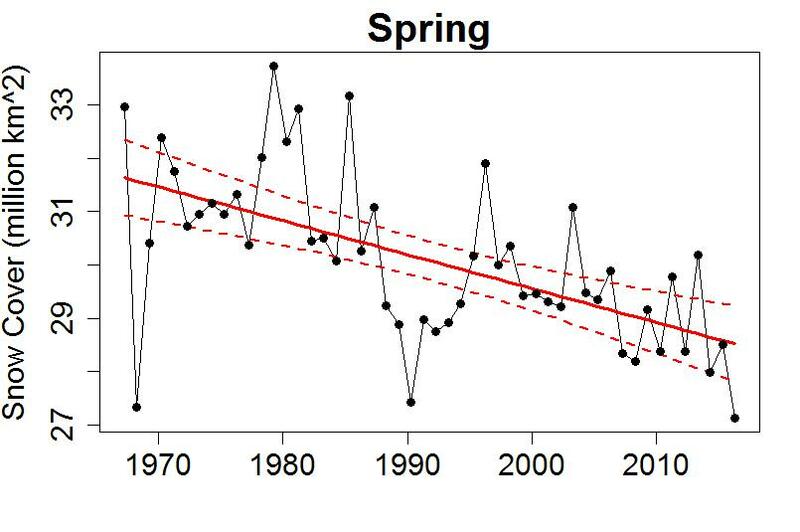 Of course there will still be fluctuations on top of any trend present, but the trend from earlier melting would mean reduced snow cover, particularly during the melting seasons, spring and summer. Second, higher temperature means the air can hold more water vapor; it’s basic physics (the Clausius-Clapeyron equation). That would mean that when it does snow, we could get more — after all, snow comes from water vapor in the air. So the trend might be for more snow cover, particularly during the snowfall accumulation seasons, autumn and winter. One wonders: what do we observe? 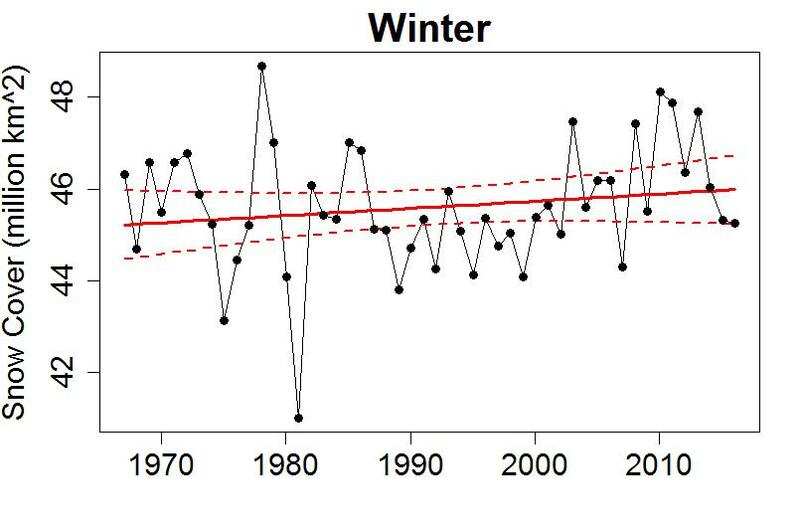 Actually, the wintertime snow cover expansion isn’t “statistically significant.” What looks like an increasing trend might just be a false impression from random fluctuations. Even the autumn expansion doesn’t quite meet the “95% confidence” standard — it too could just be random fluctuations, although there’s a good chance the upward trend is real. In either case, both autumn and winter snow cover are perfectly in line with what’s expected in a warming world. 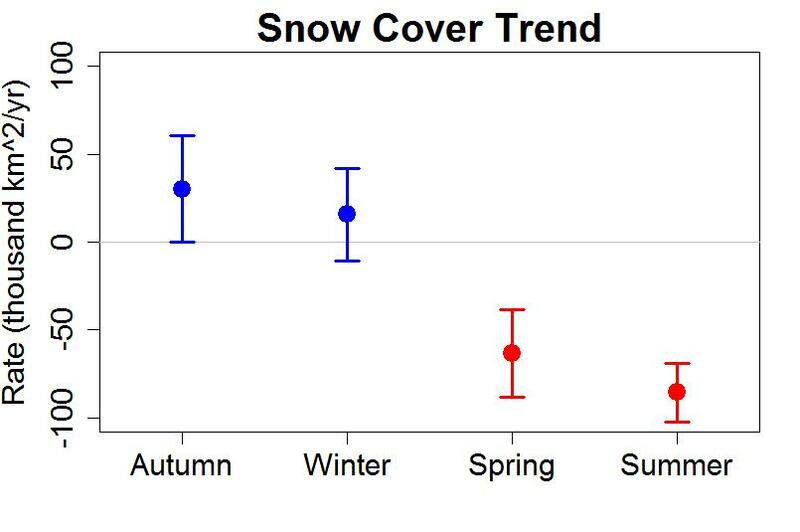 It turns out that for all four seasons of the year, the changes we’ve observed in snow cover are just what we would have expected in a warming world. If, that is, you’re smart about it. If you’d rather be the simpleton, you could use the Tony Heller way; he recently treated us to quite a snow job. He goes on to tell us that “Winter snow cover is also increasing, with nine of the last ten years above average.” But only 6 of the last 10 years have had above average winter snow cover in the northern hemisphere. The reason he says 9 of 10 is revealed by the graph he shows, which isn’t for the northern hemisphere (like his first graph), it’s for North America only. Why switch? Maybe … so he could give the impression he wanted? He seems especially insistent on highlighting the “especially since 1980” part. It talks about snow and ice, and it’s the ice part that gives us the “especially since 1980” comment. But Tony Heller doesn’t seem to get that … is that more of the simpleton’s way? 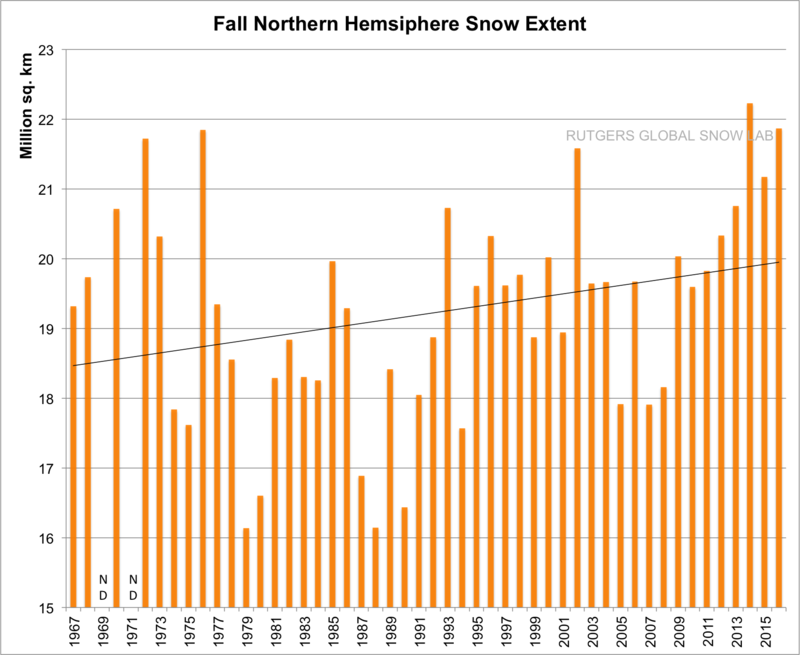 My opinion: the fact that Tony Heller did a “show and tell” on snow cover in autumn and winter but said nothing about the more extensive (and statistically significant) decline in spring and summer, the fact that he implies heavier snow cover in autumn/winter is somehow a “problem” for global warming science, and especially his offhand comment referring to the scientists who talk about it as “highly paid government experts,” indicates that he’s more interested in doing a “hatchet job” on climate science than understanding how the world is changing. Just my opinion. But maybe he can tell me … where do I get one of those jobs as a “highly paid government expert”? That “highly” paid government job talking point annoys me. Anyone saying that is f’n clueless. I’ve worked at those government jobs and was comfortable (but had no kids). Then during a lay-off I did some consulting for a private engineering firm and tripled my salary, far more than what even senior government workers were making. Found out later other consultants were charging quite a bit more than I was. When working in the field with the engineering firm I coordinated with government biologists as we were working on the same project. In one month I made 6 times what they made for the same month doing the same job in the same remote location (I was paid 10 hr days every day in the field whereas they continued to get their regular weekly salary and could only bank time, not get paid overtime). Anyone working in a government job is certainly NOT doing it for the money. The money can be found working for mining/engineering/oil/gas companies doing the same job they were doing for the government. I agree with this! Anyone who thinks climate scientists are being paid vast amounts is probably beyond help. Anyone who can do an internet search can see the median salary for climate scientists is around $60k/year. But the deniers can get that at a single “lecture”! Who are the greedy people “raking it in” on the climate debate? – The Deniers, easily, by more than 10:1. What? Oh, I think I see. Tony Heller and Steve Goddard are the same person. Except, this Tony Heller is not Steve Goddard, but likes to trick people by pretending he is. I would be happier if you either didn’t publish his comment or made it more clear what was going on. “tonyhellerexposed” is satire. It’s a satire of the actual Tony Heller (aka “Steve Goddard”). He is “pretending to be” Tony Heller in the same way Alec Baldwin is “pretending to be” Donald Trump. The point is not to fool anyone but to skewer the actual Heller. Martin, I suspect that you visited, and were blocked on, Heller’s real site, not the satire site. Heller is notorious for this. I linked to my parody blog of Tony Heller but Tamino removed it. Can’t say I blame him. It’s over the top for more sober-minded people. But I do it for a reason. Google “tony heller exposed” and you’ll find it (if Tamino approved this message). I did follow you on your blog. You repeatedly accused scientists of fraud because they corrected their datasets. As evidence of fraud, you posted graphs comparing corrected data with uncorrected data. I explained to your readers every time that all you were doing was proving that the data had been corrected, and I asked you every time to provide evidence that any change to any dataset was incorrect, let alone fraudulent. You never did that. Instead, you blocked me from posting comments on your blogs. Then I guess the “climate scientist” that said that “children will not know what snow is” is a “simpleton” as well? Unsurprisingly, the scientist didn’t say what is claimed, the context of the remarks was to do with preparedness for extreme snow events, and was (probably) specific to the UK as a whole. I think das is referring to a denier meme based on “According to Dr David Viner, a senior research scientist at the climatic research unit (CRU) of the University of East Anglia,within a few years winter snowfall will become “a very rare and exciting event”. However they never mention Dr. Viner as saying that heavy snow will return occasionally and that “Snow will probably cause chaos in 20 years time”. Between breaking the jet stream and heating the oceans, we have enabled more snow-bombs via the “lake effect” method. In the US northeast, a westward flow of cold air over warmer-than-average Atlantic coastal waters picks up a continuing supply of moisture which then gets dropped over land as snow. This is an ideal snow-making machine set-up, and we’re seeing it happen more often these winters. Interestingly, I’ve been thinking something along those lines. We’ve been having a lot of warm weather and some pretty heavy rains, and I’ve been thinking those would be some blizzards, waiting for it to get cold. One thing that *is* certain is that wet is more wet than it used to be, and consistently so. East coast (US/Cdn) nor’easters are hardly going to go away in the post January period. All indications are they may grow and dump even greater amounts of snow when they hit. That does not mean the globe is cooling, no matter what Oklahoma senators or dropout weather boys may think. Literally each of the last 20 runs of the GFS has been vastly different for weather next weekend in Northeast. My point was that as soon as it gets cold enough, any of that precip is going to be fierce. The phony skeptics make a big deal of snow, but lovers of mod cons would not enjoy a world in which winter is gone at all. I’d guess that’s a century or more away in these parts. Contribution sent, with thanks for pointing out the bullshitters. Somewhat off the main topic, but what happened in 1980/81 – from the Autumn and Winter graphs, it looks like a very, very light year for snow. Was something going on then? As i understand it with my very limited knowledge it seems to me that the northern circulation around the north pole has been disturbed due to having water as the center against the south pole having land as the center. With the lessening of ice on the water the northern circulation has become more expansive resulting in cold fronts going further south over the north of America and Russia. This should result in colder temperature and higher snow falls further south. As i understand it there will be reading where further from the pole the temperature is lower than further north this is not normal. I expect to read about this as being proof that the world is going into an ICE age anytime soon. If the Atlantic Current stops then north east USA and north west Europe will suffer a sudden plunge in temperature. As these two areas are heavily populated then i expect a sudden outcry about we are going into an ICE AGE. I hope this does not happen I would not be surprised if it does with the resultant dismal results. Oh yes, Tony Heller/Steve Goddard is very interested in takedowns, clever, shallow, insulting, anything that will undermine. In general, fake skeptic arguments are full of snarky criticism and fake claims of common sense. It’s simple – Tony Heller is a crook. What this suggests to me is that regional warming in the arctic is driving the changes in the arctic, but in the mid latitudes the winters may be trending colder. This would be consistent with ocean currents transferring heat into the arctic thus reducing the number of days below 0. This of course is just off the top of my head. Why would you think that mid-latitude winters are getting colder? Data shows that they are getting warmer. The increase in temperature in winter is greater than in summer. Go to the NCDC and look at the monthly temperature graphs for the USA. In general everywhere is getting warmer in all seasons. It is possible to find a few very small locations (like the ocean south-east of Greenland) that buck the trend, but no large areas are getting colder. 1. The “tonyhellerexposed” blog is satire. He pretends to be Heller in order to make fun of him, and he does a good job of it. 2. David Viner was referring specifically to British children, not all children, and he didn’t put any particular timeframe on his off-the-cuff remark. He said “a few years,” but to a climate scientist who’s used to thinking in multidecadal terms, that probably doesn’t mean literally a few years (as in three or four). It was likely an overstatement, but the deniers take great joy in heaping ridicule and abuse on him, as “DAS” tries to do by enclosing “climate scientist” in stupid scare quotes. Viner is a climate scientist, and a good one. He was a senior research scientist at CRU for 16 years. DAS’s scare quotes fail to remove his training, experience, and published research. In the winter, the colder it is the further south the rain/snow line is located, resulting in a larger snow cover area. I think this is indisputable, but you do not mention it. Yes, warm air holds more moisture, but the moisture for large snow storms comes from open water, usually the oceans. There is very little moisture in even warmer winter air. As you may recall as you live in the northeast, two years ago we had record snows as the air was very cold and ocean storms dumped feet of snow as the storms brought the ocean moisture into the cold air. The cold air did not restrict snow totals, it enhanced it. Not to mention that global warming is delaying the formation of sea ice, so there’s more open water in far northern latitudes in autumn and winter. I think it’s irrelevant, since land temperatures (even more than GMST) are up, not down. 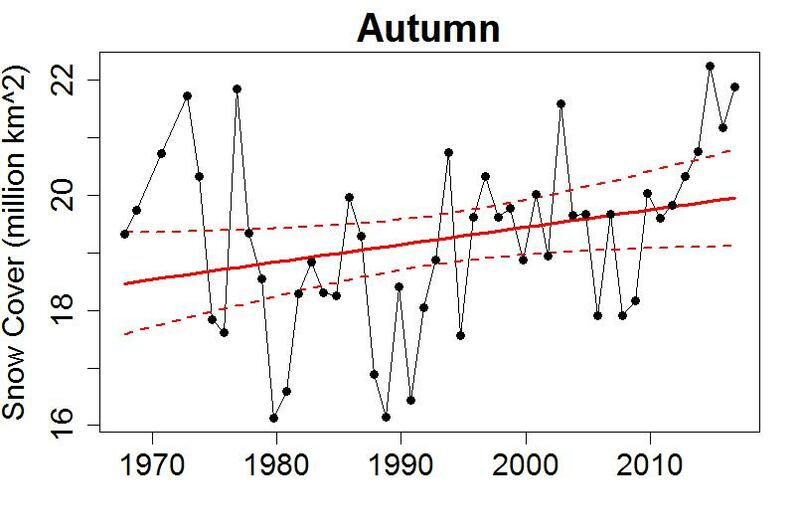 The Autumn increase is likely a dataset dishomogeneity. In the early years some of the data is missing. How was the interpolation done. circa 2010 – maybe I should update this graph. Your green graph isn’t the full picture. I have a graph of Rutgers Uni snow data here (usually 2 clicks to ‘download your attachment’) While you attempt to account for the relative change of snow cover, the inclusion of a ZERO SNOW ANOMALY zone demonstrates why the ‘absolute’ negative anomaly does not extend further into the summer – the snow has already all melted away. And the ‘absolute’ anmaly allows other simpe calculations. 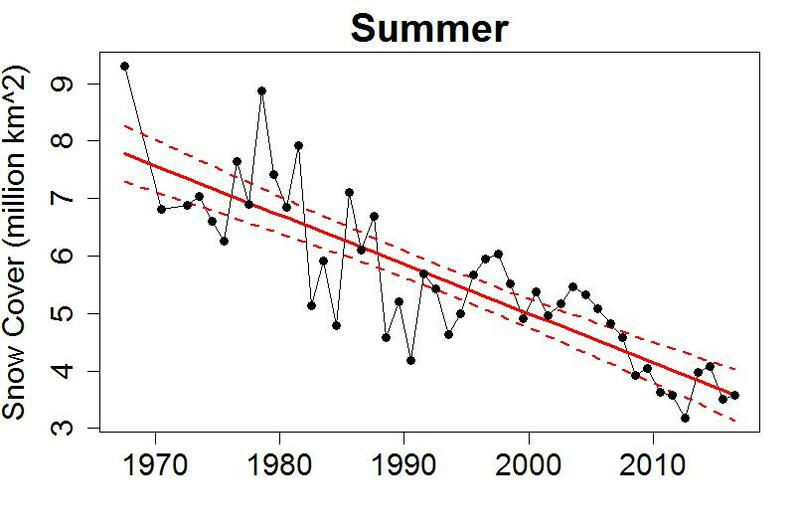 The reduction in early summer snow cover already exceeds the IPCC AR4 projection for 2070-2100 which never got below -5M sq km. Indeed, that drop of 7M sq km over roughly a 40 year period can be converted into a rough annual Northward movement of about 15km a year. Jousting with an attitude can be fun. Particularly when some of it is richly deserved (that new kind of ice comes to mind), and when there is plenty of attitude from the other side of the discussion. Tony does attitude too much. Everybody (including Tony) knows the planet has been generally warming. You think you know the reason why. Me, I don’t think you do. You surely have failed to complete your comment and I struggle to see an explanation. Perhaps time caught up with you and so you posted it before you were finished. Perhaps you fell asleep at your keyboard. Then, I note you name yourself for a group of plants that have naked seeds so perhaps this is your style, to leave things hanging in the breeze for all to see. Gosh, I thought it was pretty clear. Simple statement. The rationale behind the statement is long, complicated, and likely over your head. Are you suggesting that “it was pretty clear” that your idea is so complicated that presenting a proper explanation of it would confound all others? Assuming you are not some juvenile fantasist just landed from planet Wattsupia, may I share with you advice from an old professor of mine – ‘If you cannot explain your ideas succinctly, it will be because you yourself do not truly understand what it is you are trying to say.’ And I would add some advice of my own – learn to write in proper sentences and without using so many pronouns – clarity of your messaging is something you really do need to work at, a lot!!! Open to CO2, but still waiting for physical evidence. Blind faith doesn’t cut it. Of course, I could point out that people stopped waiting for physical evidence 157 years ago but then clowns usually respond to that by saying that they have their own standard of physical “evidence” which requires a controlled experiment that reproduces observations to at least 3 significant digits. Actually. in the real world as opposed to your fantasy world, it’s “blind ignorance” that _really_ just “doesn’t cut it”. Gymnosperm, You are a pathetic, anti-science imbecile. The reasons why are technical and probably over your head. Nice attitude. You are the anti-science imbecile. Let me know when you are ready to learn. +gymnosperm I am always ready to learn. Are you saying you believe that anthropomorphic CO2 is not the cause of almost all the global warming we have observed over the last 100+ years? From my reading of climate science (breadth first, not depth first) over several years, I can see that AGW does explain the warming we have seen, and nothing else explains it. 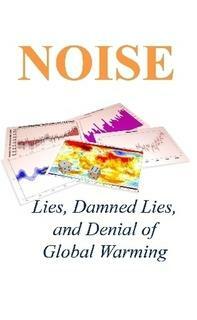 If you believe AGW is not the cause of the warming we have seen, what is the scientific basis of your belief? You got a PhD physicist with almost 30 years experience here who would love to hear your theory–or preferably read it in a peer-reviewed scientific journal. 1) It’s warming. If you dispute this, given all the instrumental, satellite, ice-melt and sea-level rise data, there is no point in discussing this with you. 2) The known greenhouse (e.g. IR spectroscopy) of CO2. 3) The first law of thermodynamics–the energy to warm an entire planet must come from somewhere. 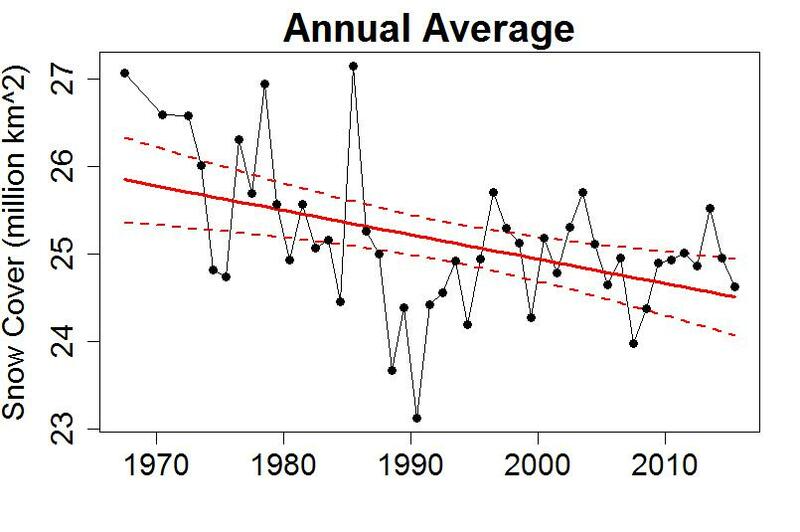 It cannot be the Sun–solar irradiance peaked in the 1950s. It cannot be the oceans–they are warming too. Models show that increasing anthropogenic CO2 could account for the warming observed. No other forcing comes close. 4) At the same time that the troposphere is warming, the stratosphere is cooling. No forcing other than greenhouse gasses sumultaneously warms the troposphere and cools the stratosphere. 5) We know the CO2 is anthropogenic, because 1)we’ve produced ~2x as much CO2 as represented by the increased atmospheric concentration; and 2)the carbon going into the atmosphere has the isotopic signature of that in fossil fuels. 6) Anthropogenic greenhouse warming was predicted 121 years ago. There is plenty of other evidence, but that ought to give you something to chew on for a while. Ah, yes, the Clausius-Clapeyron equation. I remember learning it in the Spring of 1971. It explains a lot of what happens in global warming. More desiccation for dry areas, more heavy rainfall events, and, yes, more heavy snowfalls when air off very warm water meets unusually cold air. It’s not rocket science, even if it is too sophisticated for some. I believe that another undesirable effect of increased autumn snowfall such as happened in Siberia last Fall, is that it can insulate permafrost from the extreme cold, thus accelerating its warming, and melting, in the following year. So Tony’s welcomed snow is probably doubly bad news. There are two conditions for snow cover. First, snowing, which requires moist air from warmer, or at least open ocean. Second, it must be cold enough on the land that the snow does not melt. But the importance depends on the month. In the later part of the winter, if snow already lies, snowing is less important than coldness. So the snow cover depends most on land temperature. If the land temperature increases, the snow melts and reduces the snow cover. But in autumn, if there is no snow yet, snowing is most important for snow cover. If it does not snow, it may be very cold, but there is no snow. So in this time the increasing ocean temperature leads to moister air and more snow cover. Heller has responded, if you’re interested, Tamino. Greenhouse gases preferentially absorb infrared light. The N2, O2, and Ar in Earth’s atmosphere are almost transparent to everything, but the H2O, CO2, CH4, and N2O are not. Sunlight makes it to the ground without much greenhouse absorption. The ground heats up. Like any warm object, it radiates infrared light. (So do you and I.) The greenhouse gases in the air absorb that IR, although they did not absorb the sunlight. And being warm objects themselves–gases are still matter–they radiate, too. Half the radiation goes back to the ground. In fact, we’ve got twice the “atmospheric back-radiation,” on average, as we do sunlight. Without it, the Earth would be frozen over. Let me know if you want the math. The preferential absorption and emission at specific wavelengths is a matter of quantum mechanics, but the basis of the greenhouse effect can be understood with nothing harder than algebra. Heller says he has responded a couple times more, chiefly just a jeer that the Southern US states don’t get snow despite “warming”. He said in one of the more recent comments to his first response to you (which you responded to with Part 2) that he had finally provided “all the data” but it’s nowhere to be seen. Perhaps he thinks that showing the winter-only data, merely a subset of what you have shown, is “all of the data”. You’d think that his readers would at some point be insulted that he thinks so little of their intelligence by expecting them to believe such claptrap, but I must say, they should be commended for being so thick-skinned in that matter. A striking contrast to Heller—maybe that is why he is so afraid of global cooling.